Discover some of the latest Indian pooja room designs with us. A traditional Hindu family always has a separate room for pooja and holy rituals. These rituals help maintain the peace and sanctity of the household. Here are some traditional as well as modern Indian pooja room designs for you to incorporate in your pretty homes. 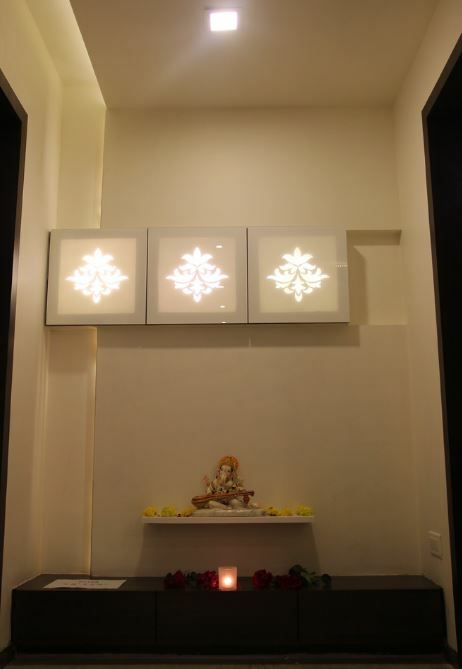 This beautiful pooja room is awe strikingly beautiful with backlit onyx. The deity and the accessories are all made of brass. Brass is an auspicious metal majorly used for pooja purposes. Take immense care when illuminating your pooja room. Keep the placement in such a way that they highlight the deities. 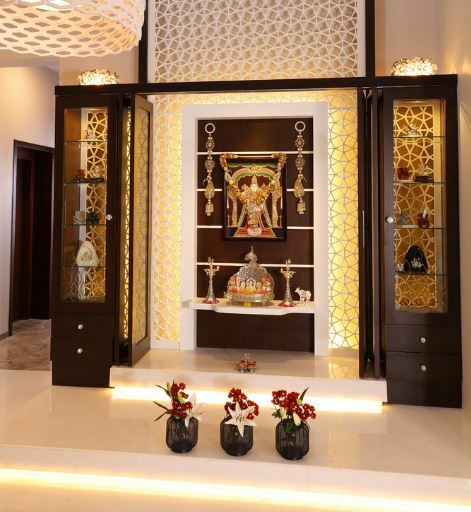 This Indian pooja room design seems like it’s integrated in the centre of the living room or dining area. 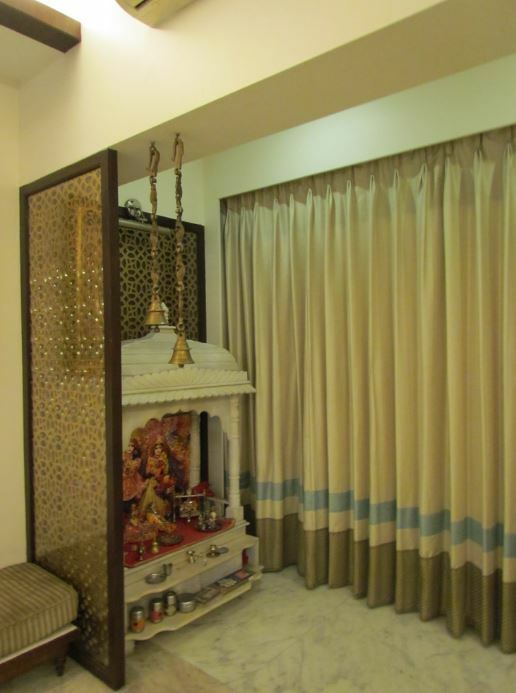 Pooja rooms are auspicious and send positive vibe throughout the home. Hence, people like to design this sacred space in the centre of their home. The green plants are in a way infusing nature in the concept. Here is the traditional mandap neatly placed inside the pooja room. The glass door captures my interest because even at night the deities are clearly visible from outside. 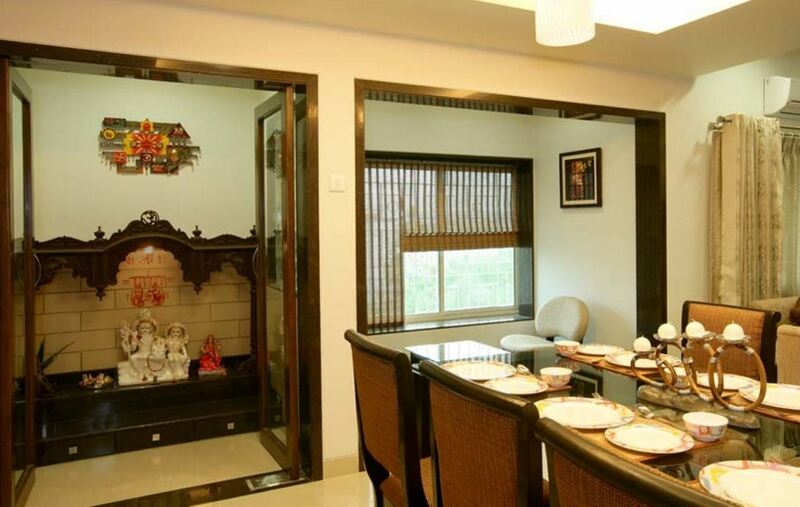 This pooja room is quite compact and therefore apt for apartments. The mandap has loads of storage space for pooja essentials. This is an elegantly designed prayer room. The backdrop is amazingly attractive. The light fixtures and the frame work add more to it. The deity is kept with utmost reverence in a nice clutter-free manner. 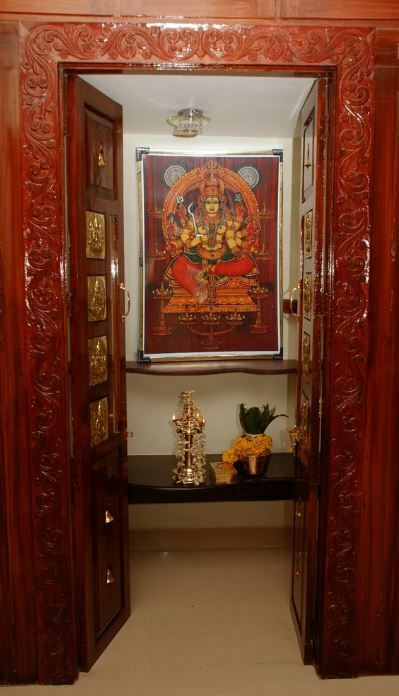 Flank your pooja room entrance with a nice cabinet to display statues of god and goddess. 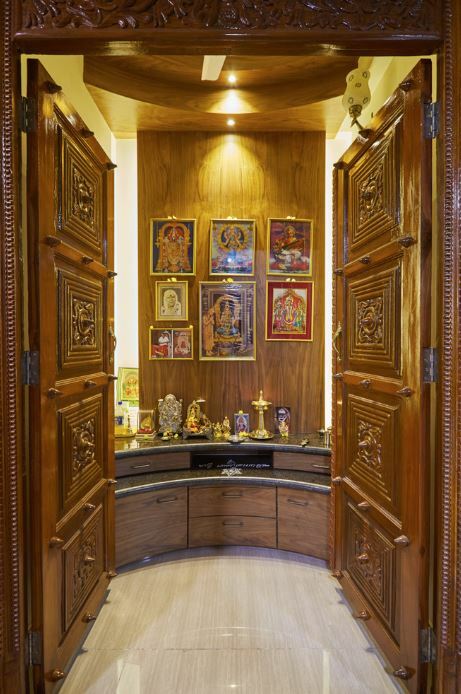 Lots of woodwork along with a glossy white floor goes into this attractive pooja room. There are intricate designs carved on the door. The curvy elevated mandap also flaunts nice storage capacity. Use the wooden panel to hang photo frame of deities and keep the idols on top of the cabinet. Convert one corner of the living room into this elegant looking pooja room design. Build a simple mandap/mandir in it with some drawers and cabinets for storing pooja essentials. 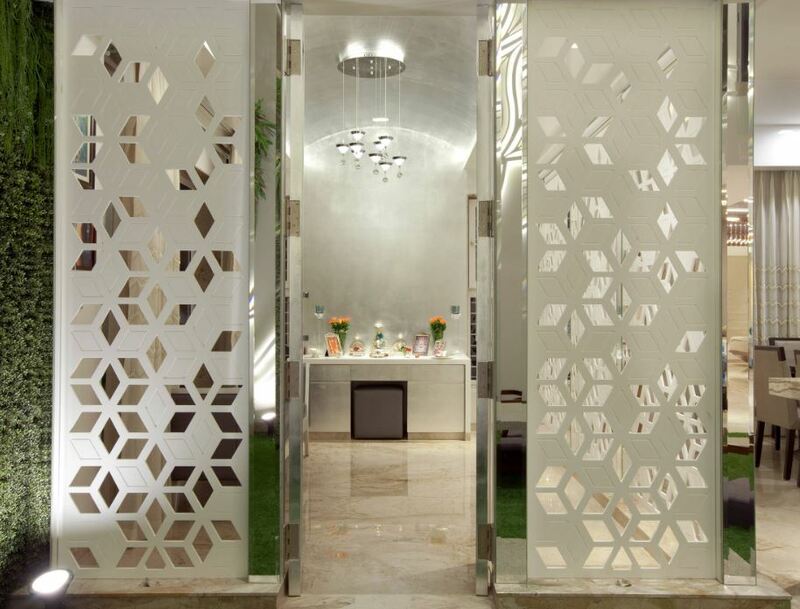 Enclose it by a glass panel on one side and install glass doors to get this amazing look. 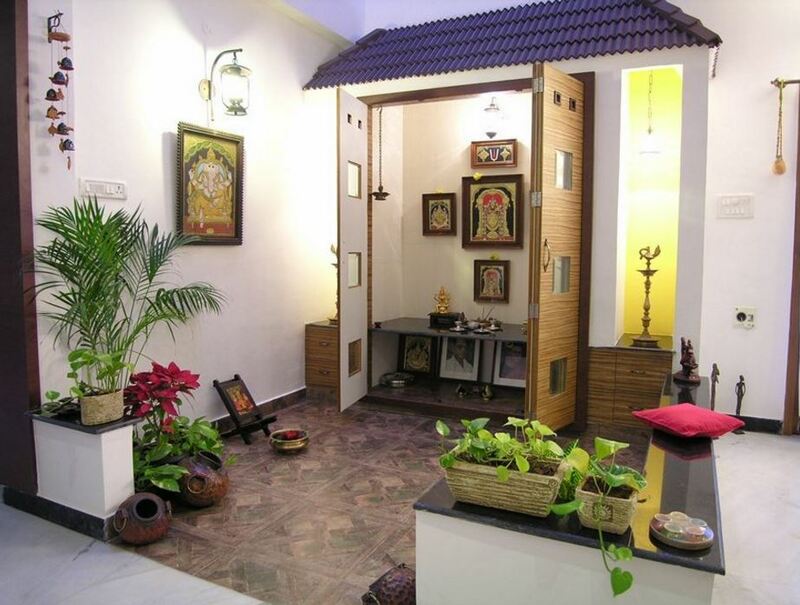 These Indian pooja room designs are an integral part of any Indian house hold. Every Indian woman has the aesthetic sense to decorate a pooja room with whatever material is easily available in the house. Adorn the pooja ghar door with toran and curtains. 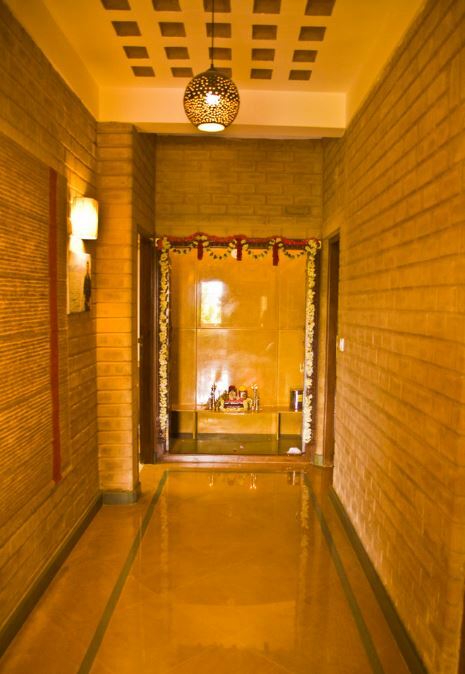 This is a modern pooja room design; the long corridor leads to a mesmerizing pooja space. It is minimalist and creates a space and mind which is clear of clutter and ideal for spiritual reflection. The soft lighting makes way for this aesthetically appealing concept. Ensconce a marble mandap within an elegant background panel. These panels help in creating a small enclosure. It also acts as a divider between the mandir and the living room. It has traditional bells hanging from the ceiling that enhances the aura of spiritualism within. If you are struggling with space then check out this pooja room. This one fits into any small narrow space that you have in your house. This modern pooja room has a majestic feel about it. 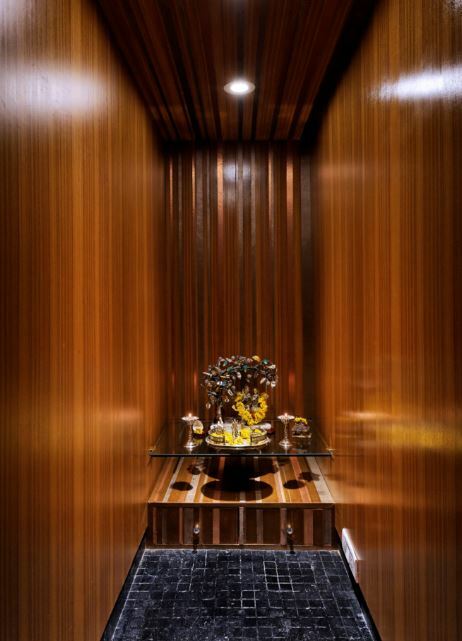 Go for wooden walls and black tile flooring. The lights reflecting on the wall maximizes the softness in the ambience. Look at the marvelous and intricately carved marble pooja room design. The marble work resembles to the one that is often seen in Jain temples. 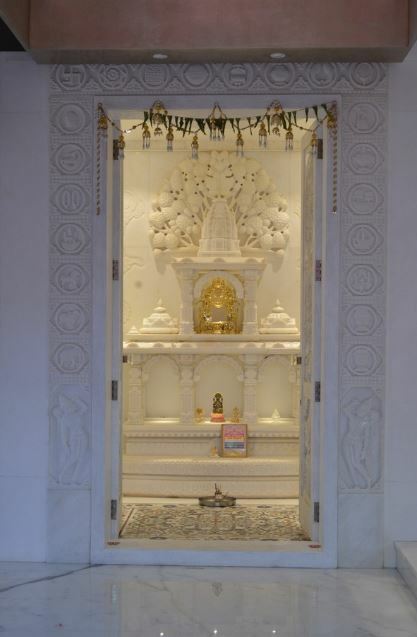 Marble gives a pure and divine to this pooja room. And, it is also instrumental in enhancing the element of spirituality and piety. The entire atmosphere in this pooja room talks about peace and serenity. The chief attraction is the beautiful storage area above the deity. You can highlight them by using back lighting technique. It also has three drawers wherein you can store pooja items and accessories. This vibrant and colorful pooja room is full of positive energy. Use of red and gold takes this pooja room to a completely different level. 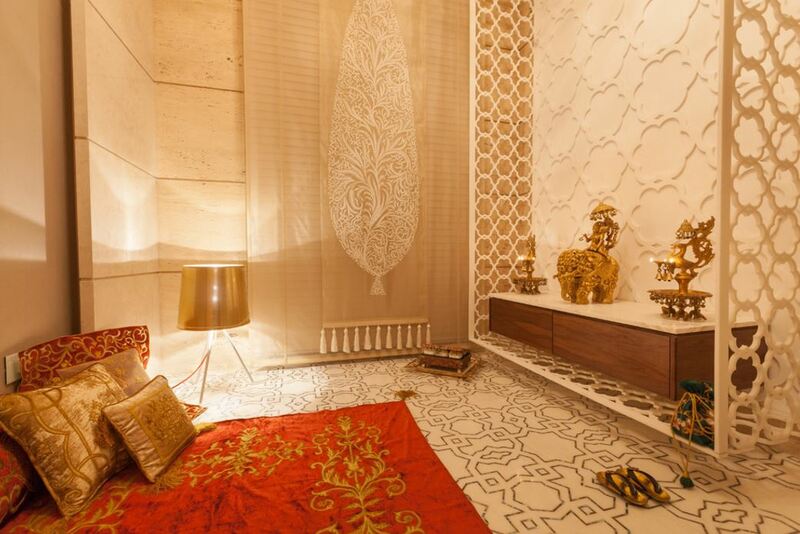 The intricately carved brass deity and the traditional lamps create an incredible pooja space. I love the leafy tapestry on the side wall. 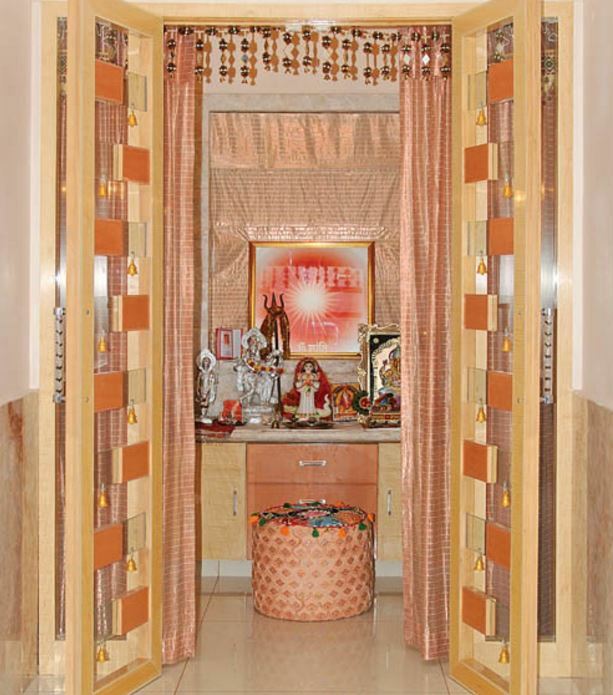 Look at the beautiful entrance of this pooja room. The infusion of white color throughout the decor makes the room look chaste and pure. Keep the deities on a high pedestal and organize them neatly. The seat though cleverly concealed doesn’t go unnoticed as it is a great relief for the aged. 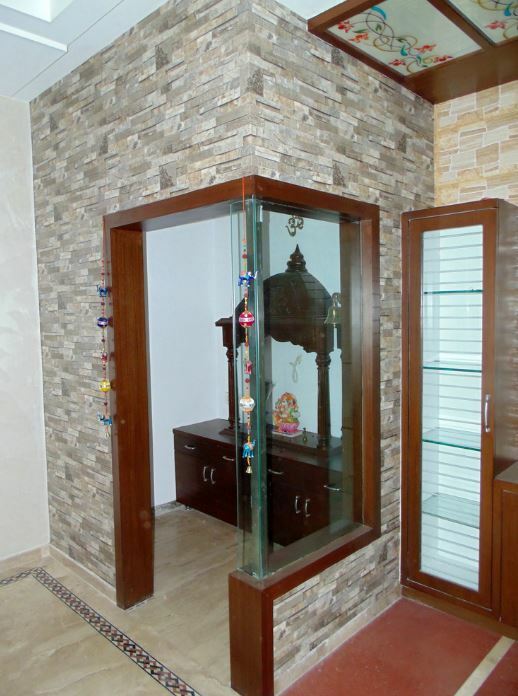 Here is a conventional pooja room design in wood. The wooden door with bells has intricate carving on it that adds to the flavor of traditionalism. Even the interior is kept simple, neat and elegant. The pooja room is totally clutter-free having one photo frame and minimal accessory. 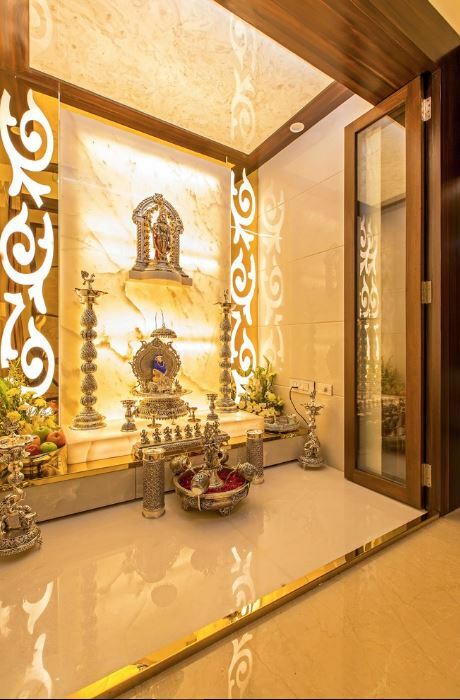 This entry was posted in Pooja Room, Pooja Room Designs and tagged Design of Pooja Room within a House, Indian Pooja Room Design, Indian Pooja Room Designs, Indian Pooja Room Ideas, Indian Puja Room Designs, Mandir Designs for Small Room, Modern Pooja Room Designs, Pooja Room, Pooja Room Design, Pooja Room Design for Homes, Pooja Room Design Ideas, Pooja Room Designs, Pooja Room Designs images, Pooja Room Designs in Apartments, Pooja Room Designs in Glass, Pooja Room Designs in Hall, Pooja Room Designs in Kerala, Pooja Room Designs in Wood, Pooja Room Designs India, Pooja Room Ideas, Pooja Room Ideas in Small House, Pooja Room Images, Pooja Room Interior Design, Pooja Shelf Designs, Puja Room, Puja Room Designs by Preeti Sinha. Bookmark the permalink.